Formal negotiations have reopened at the UN climate summit in Copenhagen after a delay of nine hours. The hold-up was caused by wrangles over the texts to be used as the basis for the talks. Beneath the dispute lies a long-running accusation from developing countries that the Danish hosts are trying to sideline their concerns. New funds have been pledged, notably by Japan which will provide $5bn a year to poor nations if a deal is reached. 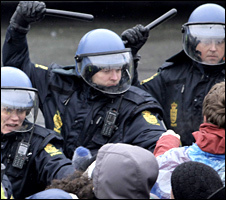 Earlier, police clashed with protesters who stormed barricades around Copenhagen's Bella Centre. Campaign groups have been angered about restrictions on access to the talks, and by the glacial progress of negotiations. But Japan's pledge ramps up significantly the amount of "fast start" money on the table. Its $5bn per year - payable from 2010-2012 - adds to the £3.5bn per year commitment made by EU leaders at their summit last week. But it will only kick in "on the condition that successful political accord is achieved... that is a fair and effective framework with participation of all major emitting countries and agreement of their most ambitious targets". Japan has been especially determined that emission curbs from major developing countries should be legally binding. China, its big regional economic rival, is adamantly opposed. Another pledge came from a six-member group - Australia, France, Japan, Norway, the UK and US - which will collectively commit $3.5bn over three years to combating deforestation - again, "in the context of an ambitious and comprehensive outcome in Copenhagen". The UK commitment will come from its component of the EU's $3.5bn per year. Columbian Environment Minister Carlos Costa, whose country would benefit from such an initiative, said: "We welcome initiatives such as this one that provides prompt start finance that will allow developing countries, and their communities, to start work on the ground." The formal negotiations, which were due to start at 1300 local time, eventually got underway at 2200 - a delay caused by the Danish hosts angering developing countries by trying to introduce new documents as the basis for negotiations. Developing countries insisted on using documents that have come out of negotiations that have been going on for most of the year. The new Danish texts were reportedly shown to a few key delegations and rejected out of hand. Delegates waited in the conference hall with no information about when the session would begin. The issue illustrates the continuing divide between rich and poor blocs here, with developing countries repeatedly accusing the Danes of trying to impose a shape on the summit that will lead to the outcome desired by developed nations. Towards the end of the evening, a group of about 30 protesters were preparing to spend the night in the centre, apparently with the blessing of security guards. During the day, police detained more than 240 protesters during the clashes, which led to injuries on both sides. In the main hall, meanwhile, a succession of presidents and prime ministers made set-piece speeches. Ethiopian Prime Minister Meles Zenawi, on behalf of the African Union, gave some details of a proposal - drawn up with substantial French involvement - aimed at breaking the impasse here. "Every one of us knows that Africa has contributed virtually nothing to global warming but has been hit first and hardest," he said. Mr Zenawi related some elements of his proposal, including that the sum of $50bn per year by 2015 and $100bn per year by 2020 should be raised for poorer countries through "creative financing mechanisms" such as taxes on financial transactions and aviation fuel. He acknowledged that he knew his proposal "would disappoint those Africans who from the point of view of justice have asked for full compensation for the damage done to our development prospects". It certainly infuriated the African group of negotiators, because it also endorsed positions that most African countries oppose - notably, a target for maximum temperature rise of 2C (the G8 and EU target), whereas most African governments are committed to 1.5C. It is not clear whether his proposal has support from other African leaders, however, or from further across the community of poor vulnerable countries such as small island states. Lord Stern, who has had a strong hand in developing the proposal, said it was "strong and reasonable". "The rich countries should give their strong support to the Meles plan, which has been put forward by an African leader with the interests of developing countries at its heart." Other speeches exemplified the fault lines running through the process. While EU delegates spoke of achieving the 2C target "if everybody is now ready to overcome the procedural obstacles", developing countries made clear that they viewed the continuing chaos over texts as a matter of principle, not procedure. And Nauru's president, Marcus Stephen, demanded proper legal negotiations on the lower temperature target. "The science tells us that we must limit the rise in global temperature to well below 1.5C to preserve the chance of avoiding the worst impacts of climate change. "To accept anything less would mean the destruction of our marine ecosystems, shortages of food and water, and the relocation of our communities. Please tell me - how is this practical?" Earlier, UK Prime Minister Gordon Brown conceded that a deal might not be achievable here. But, he added: "If you don't get an agreement this week, people will doubt whether you can get an agreement at all."